The components for measuring voltages are minimal: a voltage divider that reduces the input voltage and feeds the divided voltage to the ADC3 input pin. With this configuration voltages of up to 20.5 V can be measured. The resistor 56k2 is selected to ensure a short sampling time of the ADC: if the feed resistance is too large, the sampling time is prolonged from 1.5 to two clock cycles of the ADC. Of course, the experimental board here can also be used here without modification of the source code. 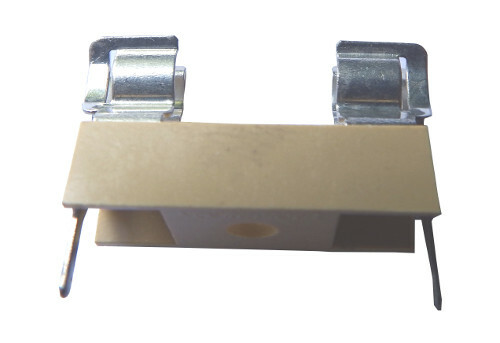 To the left is the resistor of 56.2 kΩ, to the right the 1 MΩ. If you use other values, you will have to change the constants on top of the source code. With that change you can use any resistor combination. The ADC is programmed to use the internally generated reference voltage of 1.1 V, to be independant from the operating voltage of the ATtiny13. The voltage on the ADC3 pin is UADC3 = UInput * 56.2 / (1000 + 56.2) = 1.1 [V]. The maximum measurable voltage therefore is UInput = 1.1 * (1000 + 56.2) / 56.2 = 20.673 [V]. Per ADC bit the resolution is 0.02 V.
The source pin for the ADC is ADC3, which is written to the MUX port of the ATtiny24. As no other channels have to be measured in this version, this does not change. As reference for the ADC the internal 1.1 V is used, the results are not depending from the operating voltage. The measurements are averaged over 64 single measurements. This results in a measurement/display frequency of 119&nbsl;cs/s. to display the voltage a resolution of 0.01 V makes sense because this is the the ADC resolution of the 10 bit ADC. The calculation therefore is a 16-by-16 bit multiplication, with a 32 bit result. By changing this constant we can accomodate to any other divider relation. The result of the multiplication and the dividing by 65,536 yields values at maximum slightly above 2,000. For converting the binary to ASCII it is sufficient to start with thousands. Suppressing leading zeros shall only apply to 1,000s, to make sure that at least one digit before the descimal point is displayed. The decimal point is to be displayed after the hundreds. The program is rather straight forward, the source code is here. To assemble requires the LCD include file. tst rR0 ; LSB zero? cpi ZL,LOW(2*DecimalTab10) ; Decimal point? New in this code is SUB register,register. This subtracts the content of the second register from the first one and stores the result in the first register. The internal 1.1 V reference makes it possible: the ATtiny24 measures its own operating voltage. When measuring currents it is crucial to have a as-low-as-possible input resistance to avoid distortions by the measurement. We here use a very special feature of the ADC in newer tiny devices that helps us with that. The current is measured via the voltage drop over the resistor of 0.1 Ω. The fuse that is in series with that resistor limits it to 2 A and protects the resistor and the controller input pin ADC2 against short circuitting. The input ADC1 serves as differential input and is grounded. Measured is the differential voltage between ADC2 and ADC1, and this difference is gained by a factor of 20. 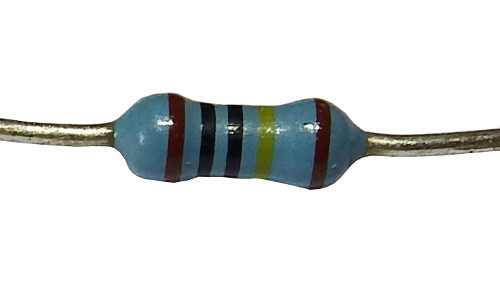 This here is a usual 0.1 Ω resistor. 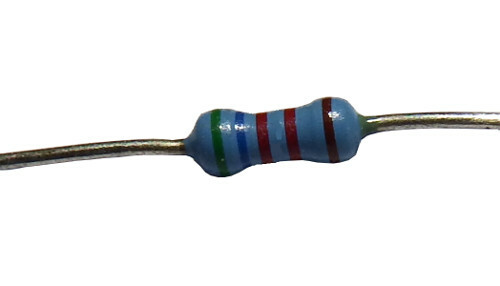 This wire resistor is specified for 5 Watts thermal power, while we would only need P = U * I = (I*R)*I = 4*0.1 = 0.4 W or the next higher rated (0.5 W). Unfortunately those resistors are not sold, so we take what we get. 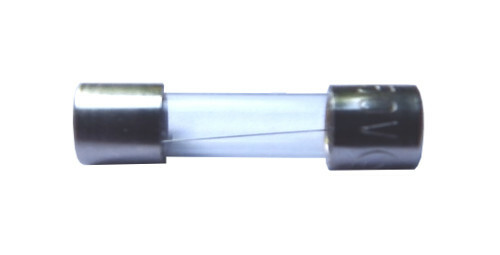 That is how the 2 A fuse looks like. And this is a respective fuse holder. To fit to our breadboard we need to solder two short wires to it. 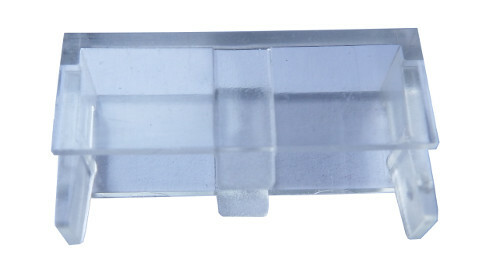 To a fuse holder belongs a fuse holder cap. This is not necessary here because we only measure low voltage DC. So see it rather as dust preventer. At full swing the ADC input reaches the reference voltage of 1.1 V, divided by the differential gain of 20, which is 0.055 V. With a resistor of 0.1 Ω this corresponds to a current of I = U / R = 0.055 / 0.1 = 0.55 A or 550 mA. Per ADC bit this is a resolution of 0.53 mA. A display resolution of 0.1 mA would be sufficient. If we would not select a gain of 20 but of 1 (normal ADC input), our full range covers currents of up to I = U / R = 1.1 / 0.1 = 11 A. To cover that whole range our resistor should then have a power of P = I2 * R = 11 * 11 * 0.1 = 12.1 W. Per ADC digit a resolution of around 11 mA would apply. The display should then have a resolution of 0.01 A. And, of course, we need a higher-rated fuse. Measuring differential voltages involves just sending a different bit combination to the ADMUX port. The device databook for the ATtiny24 says which MUX bits can be used and lists all those combinations. When measuring currents, we sum up 64 single values, just like in the previous chapter. The measured voltage on the ADC2 input is Umeas [V] = R [Ω] * I [A]. From that I [A] = Umeas [V] / R [Ω]. With a differential gain of 20 I [A] = 20 * Umeas [V] / R [Ω]. With a reference voltage of 1.1 V we see Nmeas = 20 * Umeas * 1024 / 1.1. Also is 20 * Umeas = Nmeas * 1.1 / 1024 and therefore I [A] = Nmess * 1.1 / 1024 / R. For 64 summed up measurements I [A] = NSum-meas * 1.1 / 1024 / R / 64 / 20. For a resolution of 0.0001 A the integer value would be I [0.0001 A] = 10000 * NSum-meas * 1.1 / 1024 / R / 64 / 20 or 0,0083923 * NSum-meas / R. Multiplied by 65,536 a multiplication faktor of 550 results. With 0.1 Ω a multiplication factor of 5,500 results. The whole formula then is I [0.0001 A] = 5,500 * NSum-meas / 65536. The measured sum is a 16 bit binary, which is to be multiplied with the 16 bit binary 5,500. The lower two bytes of the result can be used to round the result in the upper two bytes (division by 65,536). For conversion into the display format of 123.4 mA first the thousands, then the hundreds and the tens are calculated. Following the hundreds no suppression of leading zeros is needed any more, prior to the ones a decimal point is to be displayed. An alternative display format would be 1.234(5) A. That would require some changes to the source code, but is possible and simple. The program is listed here, the source code is here. For assembling the LCD include routines are required. ; Used: Z = R31:R30 for LCD etc. cpi rimp,cMuxU ; Was voltage measured? tst rmp ; Digit zero? tst rM2 ; LSB zero? mov rmp,ZL ; All ones shifted out? That is such an example (the German version). The ATtiny24 has an internal temperature sensor. This is utilized here. For measuring the temperature no external components are necessary. Temperatures below -40 and above +85 °C are unpractical and beyond the operating range of the controller. The temperature measurement is initiated by setting the ADC multiplexer to 8. This is documented in the device databook and used in the source code. t [°C] = 65536 / 64 * 0.89286 * NSum-meas / 65536 - 245 = 914 * NSum-meas / 65536 - 245. Factually the parameter 245 is inaccurate and has to be adjusted. To determine this parameter practically, the display of the measured temperature is in hex. This resulted at 21°C in 0x013A, hence 35.8. The temperature was by 15°C too high, the parameter 245 had to be increased by 15.
Who wants it even more accurate has to determine the slope, too, by determining the ADC result at two different temperatures and change the parameter cMultT in the source code accordingly. The current source code displays the temperature with a resolution of 1°C. For displaying a resolution of 0.1°C has to change the math, e.g. the multiplicator should be 9,143 and the subtractor 2.445 to arrive at tenth of degrees. As the physical accuracy is only 0.89°C, the displayed tenth of degrees pretend a higher accuracy than really is. The displayed temperature is an integer value. It can be positive or negative. The program is listed as follows, the source code is here and requires the LCD include routines to assemble. The degree character has to be programmed actively because it is not available with the standard character set of the LCD. cpi rimp,cMuxV ; Voltage measured? cpi rimp,cMuxC ; Current measured? cpi rmp,'9'+1 ; A to F? tst rmp ; Digit = zero? Two new instructions are used here. NEG register subtracts the content of the register from 256 and stores the result in the register. This inverts negative values (bit 7 is set) to their positive value (bit 7 is clear). The instruction BRPL label branches to the label if the sign during the last operation is cleared (the value was positive). This is an example for temperature measurement.